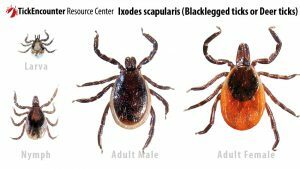 Blacklegged ticks are the only ticks carrying Lyme disease bacteria so-called ‘Borrelia burgdorferi’ in Ontario. They are mostly active in early spring (April) and fall (October). Lyme is transmitted by both adult and immature ticks, nymphs. The characteristic rash of Lyme disease is called “erythema migrans” greater than 5cm with low-grade fever, fatigue, headache and joint pain. Please contact our Clinic as soon as you are exposed to a tick bite.